I wanted to wish my friend, Eva, a very happy birthday. So, I am sharing a couple of pictures from our trip to the Grand Canyon. I have many fond memories of that trip. Like getting up at 3 AM to make the drive to Arizona before the desert started to heat up. Like when it started to pour rain after our rain dance on the rim of the canyon. 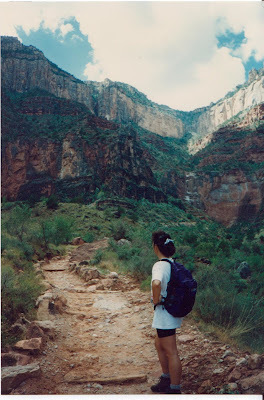 Like how hard it was to get up at the crack of dawn to start hiking down that trail towards the bottom of the canyon. Like making Eva, Marcy Darcy and Richard think I actually knew the names of the rock formations simply because I had taken a geology course in the early 80's. Like how dang hard it was walking back up that same canyon trail, in 110 degree heat,carrying about a bizillion gallons of water in our packs. Like getting up early to see the sunrise over the canyon. Wait...I didn't do that. But the rest of them did. I slept in. But, I heard all about it. Therefore, I feel like I saw it. Like being so sore, I literally had to be helped out of bed the next day. And, for 3 days after. That hike was about the hardest thing I have ever done. But, all in all, it was a great time, with good friends. Thanks for the memories, Eva. No, thank YOU!!! I love you, too! What a great trip that was! I still relish in that accomplishment with you, Marcy, and Richard!If only to be that fit again!Sigh! "Happy Birthday"!!!! it is nice to see those pics of you, anyways miss ya. "the farmer"
When I took Mr. R. to the Grand Canyon, he delighted in going as close to the edge as he could. He would say, "You stand here and when I wave, you take my picture!" Later, I would hear the people around me oohing and aahing at some dumb idiot who was at the very edge of the canyon. "Look at that guy!" they would exclaim. Then they would say, "Why is he waving to us over here?" I would look innocent. "Look at the guy!" 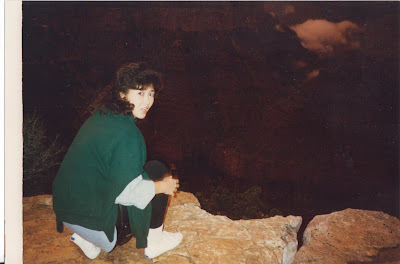 It's always been a dream of mine to visit the Grand Canyon. These are great pics! Thanks for sharing and I hope your friend had a great b-day!